" You wouldn't believe what I saw. It just turned my stomach. There were hundreds of kids coming out of the garbage. They were living in it in tunnels. Some had napalm burns on them. Their faces were all burned and they were on crutches. They were hungry. That's what they were living there for. They were waiting for the trucks to bring the garbage out there and then they went through it to see whatever they could salvage. This is something I never wrote home about. I didn't even want to believe it myself." My name is Alfred "Hal" Spadafora of Hollywood, Florida. I was born in Staten Island, New York, on September 22, 1929, the son of Louis and Josephine Juinta Spadafora. I was an only child. My parents owned the L&S (Louis Spadafora) dress factory. We had 36 machines. The jobber sent us material in bundles and we had operators who put each piece together. We had four presses, three finishers, and a floor girl. We had a big operation there. I worked there after school and in the summer. I attended grade school during World War II. We had scrap drives and a big Reynolds Wrap tin foil drive. We bought war bonds, too. In 1947 I joined the National Guard. At that point there was no war going on, but I enlisted in the Guard because they said that anybody who wasn't in some kind of reserve would be drafted. About four of us hung around together. I started out in C Battery, an artillery battery of the local National Guard (2nd Corps) that met at the 14th Street Armory in Brooklyn. We started with calisthenics and stuff like that, and every summer we went on maneuvers at Camp Drum, New York for two weeks. When the Korean War broke out, four of us in the outfit were called. At that time, anybody who was a sole surviving son was not supposed to be sent overseas. When I told them I was an only child, they didn't care. They just had orders for us to go and we went. I was part of the 955 Medical Detachment. I knew nothing about medicine until I got my training at Camp Drum, New York and Ft. Lewis, Washington. I learned first aid and how to give shots. They taught us how to give shots by using an orange and a syringe filled with water. The orange was supposed to be like the skin of a person. We also learned how to give Schick tests for diphtheria. We didn't train in a hospital in those days. We were taught by a doctor named Colonel Lyons. He was a Second World War veteran and I hated him. He sent me over to Korea but he didn't have to go. I was 17 years old at the time. There were a lot of us underage 16 and 17 year olds. After our training at Ft. Lewis, we had a ten-day furlough and they flew us back to New York. At that time we didn't know we were going over to Korea. I went home to see my folks and while I was there they told us that we were going to Korea. My mom was pretty upset. Being an only child, we were very close. She is still living today at age 99. I called her from Japan and I called her from Korea. The rest were assigned after we got to Korea. When I got onboard the Anderson, I had a fever of 103-105. I had a very bad cold and was sneezing, "Cachoo. Cachoo." I was on the top bunk and they had to go and get coffee for me because I couldn't get up. I wasn't seasick, but I probably would have been if I could have gotten up. The ship first went to Hawaii and from there went on to Yokohama, Japan. We didn't get to leave the ship in either Hawaii or Japan. We went straight on to Pusan, Korea. We arrived there in January of 1951, and were mobilized with more equipment, trucks, replacements, etc. We arrived in Pusan in the morning and we could tell right away that we were in a war zone. As soon as we got off the ship we saw that there were thousands and thousands of captured Chinese. They were being used as labor to go up into the mountains and pick up rocks. The ground where we were stationed was all soup because it had rained or something. All these thousands of Chinese that had been captured were sent up into the mountains 24 hours a day to pick up the rocks, bring them back down, and throw them in the "soup" so we wouldn't sink. You might not believe this, but I found out through an interpreter that some of those Chinese were six, seven, and ten years old. They hadn't seen their families for God knows how long. The smell in the country was horrendous. It smelled like urine and feces. They had Korean wagons with barrels that were called "honey buckets". The drivers of these wagons would go into the fields, pick up human waste, and put it in the barrels. Then they would throw it into the fields as fertilizer. I'm telling you, the smell was horrendous, horrendous, horrendous--and never stopped being horrendous. There was also another evidence of war that we saw immediately. There were dead bodies. In Pusan they put us on trucks and we went outside of the city. We stayed there for regrouping, living in big tents that slept ten to fifteen men. I remember that we were in a riverbed when we first got there. A big windstorm came along and blew everything down. It was a dry riverbed when we got there, but the river started to rise and we had to get out of there fast. From there we kept on going north. We went across the Han River like a traveling salesman. We supported all the outfits over there--the 1st Cavalry Division, the 24th Infantry, I Corps, 8th Army, a Turkish group. I can't tell you where we went. We went all over. We definitely went north of the 38th Parallel. We went to the Hwachon Reservoir, Chorwon, Kumwha--all over. I was one of two medics assigned to Service Battery, which was the one that got all the ammunition to supply the rest of the batteries in the battalion. The other medic, who was also from New York, was Bernard Gilligan. 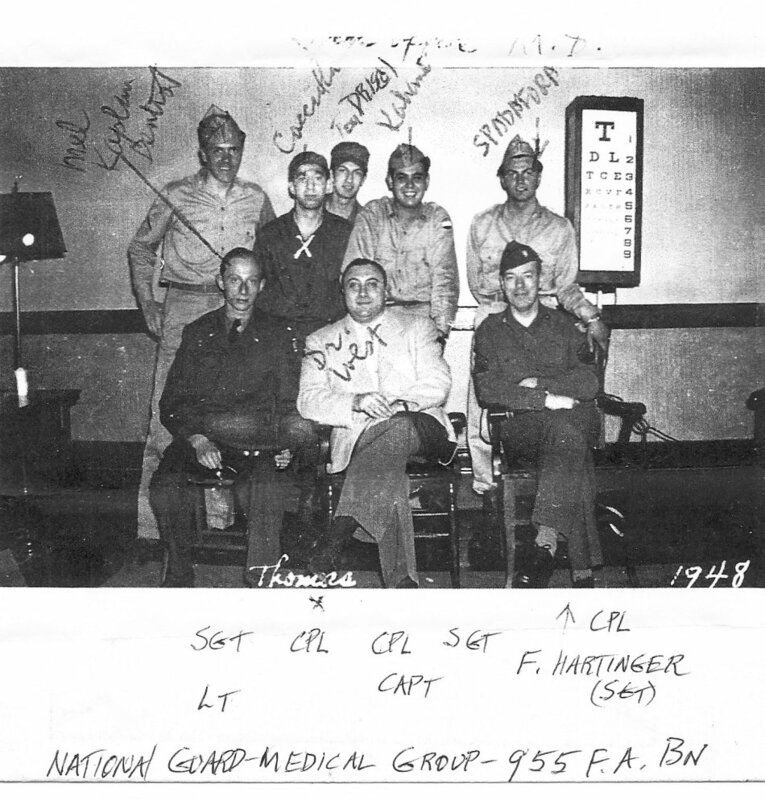 Tom Cacciola was one of the medics for "A" Battery, and there were medics for "B" Battery and Headquarters Battery. The 955 Artillery consisted of 155 Howitzers. They were the only heavy weapons they had. I had side arms, although we weren't supposed to have them since we were medics. The enemy started firing at the Red Cross signs on our trucks so we painted over the Red Cross and started wearing side arms. There were so many Chinese that they charged our battalion point blank by the thousands. They had little bags of opium on their belts. No guns. Just opium. And when they were ready to charge, they blew bugles to scare the hell out of us. The first hundred Chinese had weapons. When they fell the next ones picked up the weapons and kept running. When they fell, the next ones pick a weapon up and kept running. They were fodder. The Chinese had no regard for humanity. I saw dead Chinese bodies. There wasn't enough ground to bury the Chinese. They kept coming and coming and coming and coming. Their bodies were all torn apart. Since there was never enough ground to bury all these people, they sent for bulldozers and put the bodies in piles of a hundred. There were mountains of bodies. Then they threw napalm on them to burn them up. One time we were surrounded by Chinese and a Turkish group came in to save us without firing a weapon. They hacked their way in to us. You better believe we were pretty glad to see them. They had a reputation for being fierce. They wouldn't draw their saber unless they drew blood. We went up to a couple of them and said, "Gee, I'd like to see your saber." They told us, "No, no, no" but we insisted, "Come on. Show me." They had hash marks on their bodies because if they didn't slash somebody else when their saber was drawn, they slashed themselves. It was their tradition. At one point we were attached to the 3rd Infantry Division, which was comprised of mainly Puerto Ricans at the time. They confronted a Manchurian outfit. They were seven feet tall and the Puerto Ricans were only about five feet three to five feet six tall. They were excellent fighters, but they got slaughtered. We moved north and got up to no man's land, which was the dividing line between our forces and the enemy forces. A patrol of Chinese came our way and they stopped and exchanged cigarettes with us. It was "Hi-ya, Joe" and "Hi-ya" back. The Chinese were so dug into the mountains that napalm and everything else couldn't get to them. At one point we captured a lot of Chinese soldiers. When we captured them we interrogated them through the interpreters. This was winter time (March 1951). They had big, thick, quilted uniforms, so we put them in tents in a camp that we had and we told them to strip. That's when we found out that the machine gunners were female. They were all young girls. They were free lovers for the officers. Each night we had a head count. By morning there would be one or two missing from the tent. Some were communists and some weren't. We found out that they were burying them underneath the bunks. We found their bodies there. Service Battery got into a lot of skirmishes in the villages. The medic's job was to go take care of the men who were casualties as a result. Then there was a main medical area at Headquarters Battery. There was a big medical company there with four to six medics. They took care of the injured from A, B, and C Batteries and whoever else got injured. One time there was an engineer group fixing a road. I treated one of the guys who got pebbles in his face from the dirt that trucks were running on. He came over to me and said, "Something's wrong with my face." I took all the pebbles out of it. Another time we were in a Jeep and I was taking a guy to a hospital. If there was anyone who was really in need of help, I took them to the big 8063rd MASH hospital. On the way to the hospital we passed a bunch of kids and there was one on a crutch. I told the driver to stop the Jeep and, through an interpreter, I asked if the boy had something wrong with his foot. I asked him to let me take a look. Half of his heel was just hanging by a thread and there was a big hole in it. I said, "My God! What are we going to do?" The only thing I could do was bandage it and take him to the Korean Service Affairs. We couldn't bring him to the hospital. Then one time the outfit experienced dysentery. The Captain came over to me and said, "Doc, I want you to go out and find out what the hell is going on here." I checked everything out to make sure that everything was the way it was supposed to be--all the garbage cans were cleaned and so on and so forth. Thinking maybe something was wrong there, I decided to go out to the garbage dump to see where they were dumping the garbage. You wouldn't believe what I saw. It just turned my stomach. There were hundreds of kids coming out of the garbage. They were living in it in tunnels. Some had napalm burns on them. Their faces were all burned and they were on crutches. They were hungry. That's what they were living there for. They were waiting for the trucks to bring the garbage out there and then they went through it to see whatever they could salvage. This is something I never wrote home about. I didn't even want to believe it myself. I also delivered two babies in Korea. We had houseboys and they went out into a village and came back to me. There were a couple of bombed-out little shacks and the houseboy asked me if I would help the people in them because they had nothing. I said I would take a look. I went over there to one of the shacks and there was a little woman there. She had dirty clothes that were covering her and there was a papa-san trying to take care of her. Through the interpreter I said, "What's wrong with her?" He answered, "She's going to have a baby." I thought, "You're kidding me." She was just about to deliver so I said that I would see what I could do. She had dysentery. She delivered all right, but she died. The papa-san said he would take care of the baby, but I don't know what he did with it. The other delivery was the same thing. She lived in another bombed-out village. Her baby died. Although we moved around all the time, I got letters and packages from my folks and friends back home. Our APO (Army Post Office) address was 301. My family sent me cookies and stuff. For Thanksgiving in 1951, we had a turkey that on the package said it had been frozen in 1941. It tasted as good as could be expected. On holidays we got drunk. We got three bottles of whiskey, a six-pack of beer, cigarettes and ten bars of candy in our rations every week. I was a smoker and a drinker at the time. Since everything was bombed out in Korea anyway, there were no restaurants or anything. A couple hundred of us got to see a Jack Benny USO show once. All of a sudden "CSMO" came over the loudspeaker. That meant "Close Station March Order" so we didn't get to see all of the show. We had to go back to our outfit because it was pulling out. I later read in the Stars & Stripes that at one of these shows there were Chinese watching the show, too. They couldn't believe it. They came down and surrendered because they said if that's the way the American army was treated, they wanted to join the American army. Also in the Stars & Stripes, there was a picture of a Chinese soldier with a big keg of ice frozen to his foot. They had no food. They used to eat the grass. Unbelievable. I got to go on R&R in Japan. They gave us five days, that's all. But for those five days at least, we were out of everything. They had a bunch of women there and we went dancing. I went shopping and sent home silk pajamas and bought a jacket with a dragon on the back of it. I always, always felt like I was in personal danger in Korea. I was afraid of incoming mortar shells. And there were other ways to die, too. I remember that there was a young kid named Carothers who was in B Battery. Cpl. Charles Sheldon "Pat" Carothers Jr. was critically injured when he was caught between two trucks at Musan-ni, North Korea. He was evacuated to the 8063rd Mobile Army Surgical Hospital (MASH) where he died on September 9, 1951. We got replacements in all the time. I'll never forget the day this one kid came in. It was three o'clock in the morning and it was freezing cold. We had two oil burners in our tent. He had a flashlight and came over to me saying, "Doc, Doc. Wake up. Wake up." I asked him what was the matter and he said, "Look at me." He shined the flashlight on his face. His head was so big his helmet couldn't fit it. I got up from a sound sleep. It was so cold that I had gone to bed in a mountain sleeping bag while wearing two pair of socks, pants, parka pants on top of that, parka vest, parka coat with a hood, and my boots. I had two blankets over that. That's how cold it was. It was freezing. I said to him, "What the hell happened?" and told him to get the Captain's driver to drive him over to the hospital which was eight miles away. He said, "Nobody wants to take me." So I got up and got the Captain's Jeep. He got in the Jeep and off we went, freezing cold, wind howling, and all that. When we finally got to the hospital I asked the doctor to look at the kid and, like I did, he said, "What happened?" The kid finally told us. When he was in the Replacement Battalion Company in San Francisco, they told the men that they were quarantined and they were not to go into town. Two or three of them did anyway. They jumped the fence and went into town. When he got on the boat to Korea, he started showing signs of syphilis. He was cold. They started giving him sulfinpyrazone shots and pills. The doctor on the ship told him to turn himself in when he got off the ship because he needed treatment. He had taken so many pills that when he came to me he had overdosed. That's why his head was so blown up. He was having a reaction to the medicine. The doctor told him that he couldn't go back to the outfit until they detoxified him and then started all over again with the medication. When I told the doctor that I needed to get back to my outfit because the Captain needed his Jeep, he said, "You can't go back either. The Chinese broke through." The 1st Cavalry Division got overrun. They were building fires and they got overrun by the Chinese. 1,500 men died that night. Since I had to get the Captain's Jeep back, I started back right then. As I drove back they were bringing in the 1st Cavalry Division's dead from the mountains. It was a beautiful, moonlit night, although it was freezing cold. I was driving back when all of a sudden I heard, "Zing! Zing! Zing! Zing! Zing!" They were shooting at me. I figured I really had it. The road went around and around the mountains. All of a sudden the moon went behind the clouds and I couldn't see the road anymore because I had turned off the Jeep's headlights. When I turned off the lights, I went off the cliff and down a little embankment. And then it started to snow. The ROK Army found me the next morning with my feet wrapped around the steering wheel and my arms in the snow. They took me back to my outfit and then I was airlifted to Japan. I wound up in a hospital there for three months with frostbite. I was treated with whirlpool baths and other circulatory-type things. When my time was up at the hospital in Japan, I had to return to Korea. I met guys that were going back to Korea who had been wounded but were going back to Korea for their eleventh time. I said to myself, "My God! What's going to happen to me?" I was down to only 135 pounds after my injury. When we got to Taegu they put us on a train and then I was shipped back to Uijongbu. From there a Captain's Jeep was sent to pick me up and take me back to the outfit. I got stationed down in Service Battery and that's where I stayed. I was with that battery during my entire time in Korea. For me, the hardest thing about Korea was everything really. The whole thing was a hardship. There was nothing really good about anything. We all suffered, suffered. I think that if they had left MacArthur alone, he would have gone across the Yalu River and that would have been a good thing. We wouldn't have been in the position that we were in if he had. At the time I was due to go home, the negotiations were going on at Panmunjom. They came out with a point system for rotation home. For every month that we were in Korea we got three points. They said when we got 36 points we would be eligible to go home on rotation. I had 44 because I didn't get my replacement. When my replacement did arrive, I found out later on that he died when incoming rounds of ammunition killed him. I thought they were going to send me back, but they didn't. I returned to the States on the ship General Pope. You better believe that everybody on the ship was happy to be going home. My only duty on the ship was dispensing medication. The ship landed in San Francisco and there were bands playing and people from the San Francisco area waiting to greet us. I felt like we were getting a hero's welcome home. 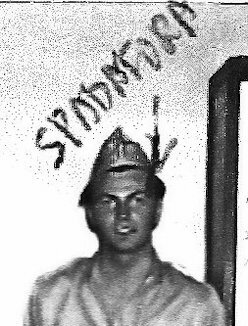 I arrived back in the States in February of 1952 and I got discharged in April of 1952. When I came out of the Army I was a dental tech, X-ray tech, and surgical tech. I thought I would try to get a job making false teeth. But they were only going to set up for 88 cents an hour. I said, "I gotta make a living," so I went into hairdressing. I went to hairdressing school and became a hairdresser and cosmetologist. I moved to Florida in 1955 and opened a salon in 1956. I became president of the Broward County Hairdressers Association and Vice President of the Broward County Hairdressers. I was then approached to be a Clairol representative, so I went around the country teaching hair coloring to men and women. When Clairol came out with the makeup, I started with cosmetics. Later on, I went to work for the senior aides of Broward County. I was a job consultant and helped the senior people find work. Then I went to work for Social Security. I was a receptionist there. I also worked at H&R Block as a telephone operator. I got a cyst on my tailbone from sleeping on the ground and had to have it removed. Two years ago I lost my leg because of the frostbite I suffered in Korea. I was in the hospital for five months. I get about 70 percent disability because of it, but I'm working on the other 30 percent. Now I have numbness in my fingers. I went over to Korea as a boy and came back as a man. I had learned a lot about life. I used to have flashbacks on Korea, but no longer. Time heals. I know there are those who are not healed yet. There were times in those pushes in Korea that when the Chinese came down with their little bags of opium on their belts and they were attacking, the GI's took the opium themselves and counterattacked. Unfortunately, that screwed up on them. I keep in touch with the fellows that were in my outfit. I attend the reunions and we correspond by phone. I have their pictures before and after in my album. I've got an application to go back to revisit Korea. I've got pictures of the Korean monument in Hollywood, Florida that was built by the local Korean War veterans. My name is going to be put on that. I've also got the New York Conspicuous Service Medal that was given to all the guys that were in the service from New York. I received a certificate stating I had been in Korea and got the Korean Medal, the Syngman Rhee Citation, and the Truman Citation. I'm proud to be Korean War veteran.